So, I’ve got my heart set on a ‘73-74 LDG, but recently got thrashed bidding on one on eBay and I’m rethinking. How much work is involved if I pick up a same era Pro/Pro II and convert it to an SD10? I know most of the Pros I’m finding only come with a couple of knee levers instead of four. Would I be better off just holding out for what I want or is a conversion doable? Sure, a conversion is doable but you’ll probably have to manufacture the parts. Some of those would be available through the “Wanted To Buy” section of the Forum. There are some on the Forum who would do it for you who would also have the parts. Is it worth it? That depends on the cost and the quality of the conversion. I’ve seen plenty of added knee levers that are poorly done which ultimately devalue the steel. Any LDG is worth holding out for but an earlier one with Gumby headstock, teardrop levers and a dustcatcher board is pretty darn cool. I play Emmons steels but stumbled across an earlier LDG not too long ago. One look and I had to have it. No regrets whatsoever. If you really want a round front LDG, you won't be happy with a converted other guitar, you might as well buy any other brand SD10. I would wait until another one is for sale. i like the idea of a conversion, and you have the added benefit of having a few extra pedals for spares. also, with these old guitars, it's nice to have a spare set of changer fingers. The idea of a conversion sounds so easy, but I think it’s based more on the frustration of “the one that got away”. My own experience with unfinished projects is telling me that I should probably hold off and wait until what I really want turns up again. And, Eric, if you’re the one that outbid me, I hate you, but congrats! ;D Hahahha! A hacked Sho-Bud is...a hacked Sho-Bud. There's square front LDG's for sale all the time. Yeah, Drew, it would be easy if I wanted a square front Damir(sp) has a gorgeous one for sale right now. Contact Ricky Davis and he will find what you want. Rick is the go to guy on ShoBud's. No, I’m not the one who outbid you on EBay. I found my LDG here in Indy from a guy who quit playing steel. Best of luck in your search. One will come along. There's nothing wrong with an older vintage square front LDG...unless you've got a jones for that rounded body. The round-fronts had 1up/1down changers with barrels behind two hole pullers, while the first-gen square fronts had 2up/1down changers with nylon tuners. 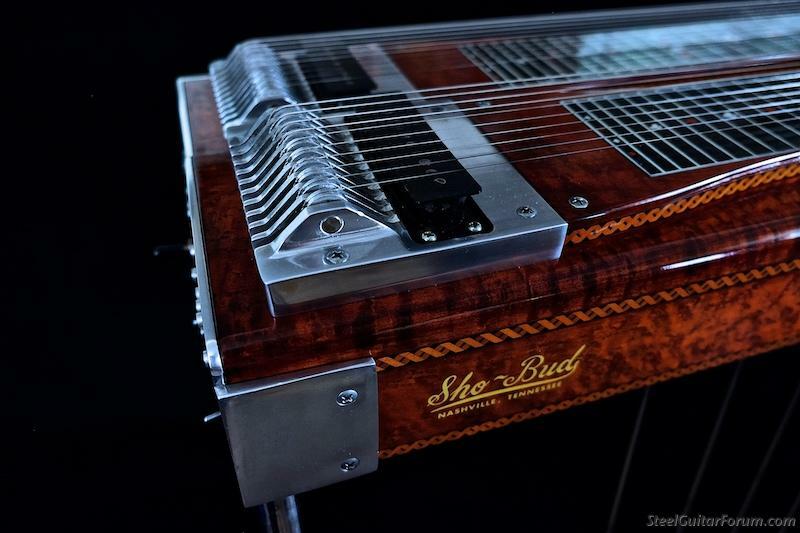 Lloyds famous Sho-bud has the updated changer and nylon tuners, even though it's a round-front body. There's a few other features that are unique to his steel, but that's another story. Damir does have a nice one on his site. That one is a newer vintage...Super Pro undercarriage, shorter body & no gumby. Nothing wrong with that one, either. The last time I played with Dan Dugmore he was playing one exactly like that. Back to your original question... I'd advise against converting a perfectly good D10, just on general principal. The LDG you want will come along eventually. A "round front" LDG is the first year LDG ONLY(lloyd has #1 and I have #2). So it was made from May 1973 until May 1974. during that time; the mechanism was the best sounding Sho~bud finger ever made; the Single/Single and so two hole pullers on round crossbars pulled the Barrels for tuning.....then at that time in '74; Sho~bud D-10's went to a new body style(square front) and nylon tuning system as they progressed to a Double Raise/Single lower finger(not the single/single anymore) and so did the LDG. Ricky, I'd guess you know the answer to my question above? Yes Brint. Lloyd loved the new LDG made for him...but after a little time playing it; being extremely picky as lloyd is...he did't like some over tones going on; so they came out with a shorter headstock which corrected those hysterics and they welded on a couple raise holes to the original single/single to pull raise the 4th and 5th strings twice and fix the rods to do nylon tuners and get rid of the barrels...that was done and also made different knee levers for him so that they can be in a better position to where and how he sits. So yes Lloyds LDG shortly became very customized for him...(that what shobud was as they always were a custom shop and met anyones needs with what they had built) Lloyds LDG is a longer scale than any Sho~bud because of that custom made Keyhead... Just know all the Jacksons and Duane Marrs and Paul Franklin Sr. were involved with many and everything at that time in Sho~bud history; but I'm not going to say who did this or who did that....ha.... as I was NOT THERE. 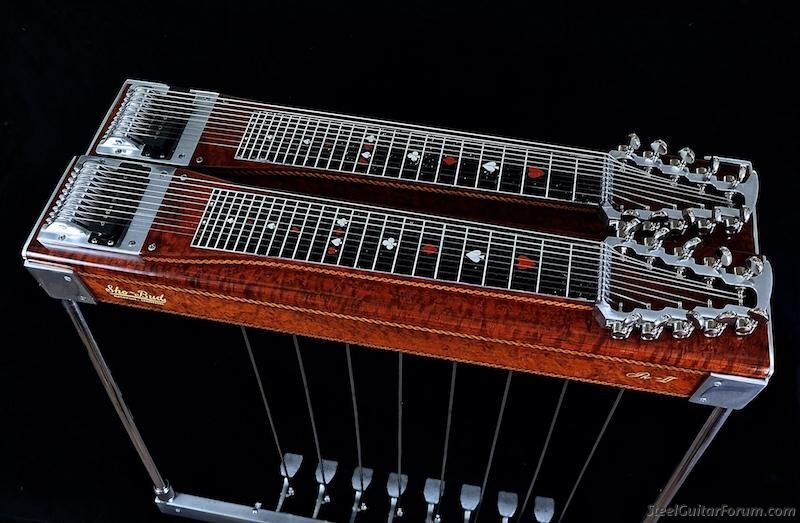 But I do listen to my mentors and learned a lot about the Great pedal steel guitar ever made. Damir, that's exactly what shouldn't be chopped up. It's perfect just as it is. 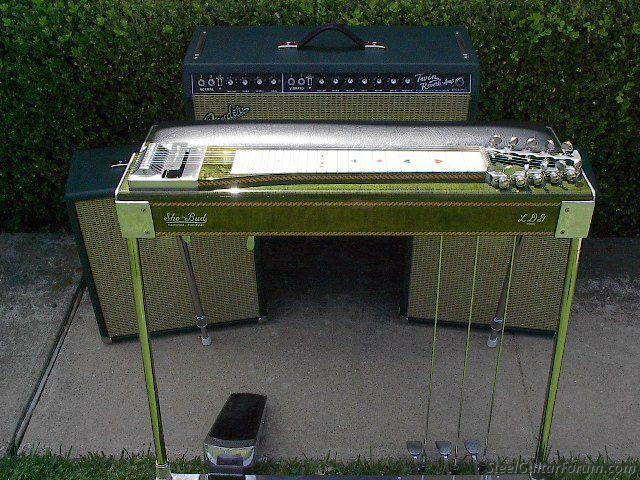 Yes Damir; that is the MOTHER SHIP of all pedal steels...and I wouldn't alter that one in such great shape either....but aweful one; I would....ha. I would pay anything for one. When I found mine....I was looking for it for 15 years; as it was the first one produced for sale as new production...and I would of paid anything for it then; which now has been close to 15 years. Ed Fulawka that built it, understood and off it went to someone that I knew loved it and would play it all the time, like it should be. That is truly a thing of beauty, Ricky! My round front 74 Pro I sounds that good but didn't cost nearly as much as an LDG!! Jason; my LDG cost me 600.00 ....how much was your S-10?? Yes I would of paid anything for it; cause it was the 2nd LDG ever made; but 600 was all the man wanted for it. But yes if your S-10 is a single/single Changer....to me; those were the best sounding Changers Sho~bud used. The George L pickup sounds a little thin, but it’s hard to tell with video recordings, so I’m definitely going to wait to hear it through my own amp before I make up my mind whether to keep it how it is, go original, or do a BL710.